It’s time for our (intermittent) Wednesday bookish game: Elite Bookish Singles! If you’re looking for the last week answer, scroll all the way down (or take a look in the comments of that post). 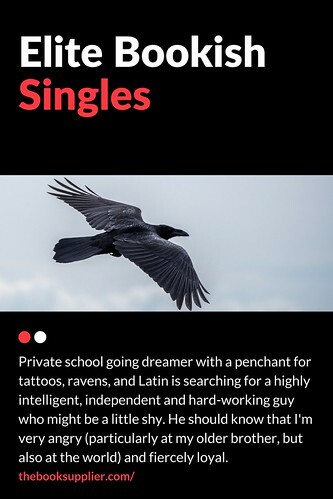 Who’s our bookish single this week? Last time, our Elite Bookish Single was none other than Katness Everdeen! Gotta love them love triangles, right? Yeah I’m still trying to figure this one out…. So worth it. It’s the one series that T and I both loved.